North Korea has expelled a group of BBC reporters, apparently because the country was unhappy with their reports. 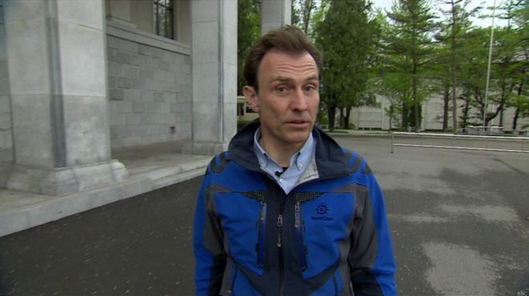 The BBC's Tokyo correspondent, Rupert Wingfield-Hayes, was detained Friday. His cameraman and producer were also detained as the group was about to leave North Korea. The BBC reported that Wingfield-Hayes was interrogated by North Korean officials for eight hours and made to sign a statement. The team remained in Pyongyang before flying to Beijing on Monday. The BBC reporters were in North Korea before the Workers' Party Congress meeting in Pyongyang. They were also following a delegation of Nobel Prize winners who were visiting the country. But the reporters covering the congress were kept away from party officials attending the meeting. The reporters also were closely monitored by North Korean representatives. The party congress has tried to show unity and support for the policies of North Korean leader Kim Jong Un. Among those policies are development of both the economy and nuclear weapons. During the congress, North Korean leader Kim Jong-Un declared his country was a nuclear state. However, he said North Korea would not use nuclear weapons unless its sovereignty is violated. Kim said he is willing to consider normalizing ties with countries that have been hostile to North Korea in the past. Experts said the North Korean leader did not offer any serious new proposals for reducing international tensions over the country's nuclear program. South Korea's Defense Ministry rejected Kim's assertion that North Korea is a nuclear power. "It is a consistent position of us and the international community that we do not recognize North Korea as a nuclear state," said a defense ministry spokesman. He said that Seoul will continue to push efforts to make North Korea give up its nuclear program through sanctions and pressure. The United Nations placed strong new sanctions on North Korea in March for its latest nuclear test in January and a rocket launch earlier this year. Korea expert Bruce Bennett from the RAND Corporation told VOA the North does not need nuclear weapons for its defense. Bennett pointed out that North Korea did not have nuclear weapons for many years after the end of the Korean War in 1953. He said during that time, it was not attacked by the United States. He also warned that once North Korea starts with a small number of nuclear weapons, that number could keep growing. "If they have more than a few, they're not purely defensive, they're starting to field an offensive capability. And that's bad news for North Korea because they may eventually push the U.S. to do something about it." Bennett added that North Korea lacks credibility on the nuclear issue because it has broken agreements and shared nuclear technology with other countries. Another expert, Bong Young-shik from the Asan Institute for Policy Studies in Seoul, doubts the commitment made by Kim Jong-Un at the congress. "I think that proposal needs to be weighed to see if it carries any significance, or it is just cover for the sake of proposing to the world that the North Korean regime might be interested in a reduction of tension." The suspects were called in and interrogated by detectives. Will the two countries sign a joint statement during Premier Wen's visit to India? McCain's campaign has defied political convention. They were ready to suffer death for the sake of their country. 1.North Korea has expelled a group of BBC reporters, apparently because the country was unhappy with their reports. A group of children are playing games on the playground. The peasants were reaping wheat with the help of a group of students. 2.But the reporters covering the congress were kept away from party officials attending the meeting. I want to keep away from the world while I am here. I warned her to keep away from that bad set.